There are two types of players, those that utilize an A/B box like our Mini A/B here, and those that don’t know what they’re missing. Add one to your pedalboard, and you’ll find the Mini A/B is full of indispensable benefits on the gig, in the studio, or even at home. At its core, the simple footswitch design selects between a pair of ¼” jacks on the left side of the unit. Hook one up and you’ll instantly be switching between amps, quickly swapping guitars between songs, using it to isolate your tuner from your signal, killing your stage sound as a mute, and more. 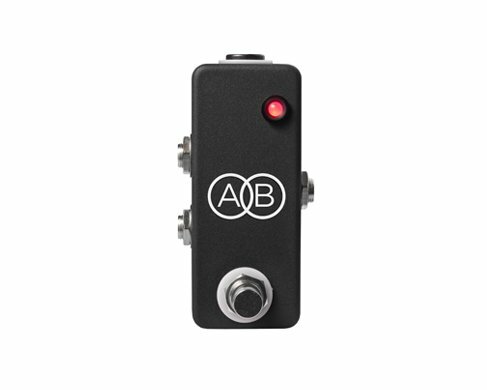 And with its adorably tiny footprint, the Mini A/B will fit on even the most cramped pedalboards. How many ways you utilize the JHS Mini A/B is only limited by your necessity. While it may not be a modulation pedal or fuzz (don’t worry, we have those for you too: Mini Foot Fuzz, Emperor), you’ll be hard pressed to find a pedal you step on more than this little gem. Like its name suggests, the Mini A/B is a bite-sized wonder. We can achieve that because of its passive design, which also means it won’t cause any tonal loss. However, we did choose to include a bright LED indicator, letting you know which jack is selected. Don’t need that light? Just unplug the power cable. The Mini A/B will still work just fine.